I was born in 1947 in Hungary to parents who lost their entire families in the concentration camps. They married after the war and settled in Zomba (near Bonyhad), where my father operated a general store. However, because of problems with anti-Semites, we left there shortly following the Communist takeover, when my father was offered a position as a rabbi in Ujpest. In 1956 came the Hungarian Revolution, and during the chaos, with the borders unguarded, we managed to escape to Austria. From there we immigrated to Canada, where I was introduced to Chabad-Lubavitch, which offered me a different outlook, a beautiful outlook, on life. When I was seventeen I came with a group from Montreal to New York for Simchat Torah. I will never forget the crowds, the dancing and the singing. The Rebbe presided over it all, and a tremendous energy emanated from him. Afterwards, I was granted a private audience with the Rebbe, in advance of which I wrote a letter telling him that I was at a crossroads. I had one more year before I finished high school, and I didn’t know which way to go after. I had already been accepted to McGill University, but I didn’t want to go, even though that’s what my parents wanted me to do. Instead, I wanted to attend a seminary to learn Jewish subjects and eventually to teach Torah. The Rebbe’s response was: “Dos iz a guteh velen – This is a good desire.” But he didn’t give me any other specific directions. He asked me a lot about my parents and what they had been through, and he gave me a blessing for them. He advised me to tell them what I wanted to do with my life, and he blessed me to succeed. But my father was not receptive to anything I told him; he had hardened his heart, and he was not going to let me pursue my goal. Primarily this was because going to seminary meant going to New York, and he didn’t want me to leave home. In hindsight, I can understand this; he had lost his entire family in the Holocaust, and he didn’t want to lose me too. But I didn’t understand this at the time, and I was very upset. So I wrote to the Rebbe, pouring out my heart to him. In response, the Rebbe suggested that I find someone who might speak to my parents on my behalf, as they might be more receptive to outside advice than to my emotional entreaties. He said that Beis Yaakov would be the right school for me, and he even offered to take responsibility for my tuition. He said it would be paid through Keren Chana, an organization he founded in memory of his mother. When word got out that the Rebbe was taking care of my tuition, various Chabad people stepped forward to help me. They arranged a place for me to stay, and everything was set. In the end, my parents accepted that I had resolved to do this, and I came to New York to study at Beis Yaakov in Williamsburg. I have always been very grateful to the Rebbe for this, and I feel connected to Keren Chana and to the Rebbe’s mother. I named my daughter Chana in her memory, and I organize a Shabbat gathering every year for Machon Chana, the school for Jewish girls returning to Judaism, which was also founded in her memory. In 1966, I got married and, right away, my husband and I were sent to Springfield, Massachusetts, to serve as the Rebbe’s emissaries. We lived there for the next thirteen years. During that time, there were several projects that the Rebbe wanted us to undertake. I think he saw that we were doers and he liked that, since he was a man of action himself. On one occasion, after acknowledging the good work that we were doing, the Rebbe directed our attention to an area that was being neglected. He wanted to know why nothing was being done for the Jewish students in the nearby colleges. “There is so much to be done but nobody is speaking up about the matter!” he exclaimed. This was long before there were Chabad houses on college campuses, and the Rebbe wanted to get something going. So we did. We started programs at three colleges – the University of Massachusetts, Smith College and Mount Holyoke College, which were all about forty-five minutes from Springfield. We brought the students down for Shabbat meals and some of the young women went on to study at Machon Chana as a result. On another occasion, after I mentioned to the Rebbe that we didn’t have a functioning mikveh nearby, he responded, “You live in the area, get the project started.” And he gave me a blessing to succeed. He wanted me to take action, and I did just that. I set up a meeting with all the local rabbis, and when the question of money came up, I put down the first $500 to get the ball rolling. Truth be told, if it hadn’t been for the Rebbe, I never would have done that, because we didn’t have $500 to spare. But don’t you know, the next day, a check for $500 came in the mail for some back money we were owed, so we were covered! The mikveh took a while, but it was eventually built – I believe due to the Rebbe’s blessing and inspiration. I took his advice very much to heart, just as I took everything he said very much to heart. I set up a class to study Chovot HaLevavot with other women, and I learned to live in the moment as he suggested, and that helped me not feel so overwhelmed. And this advice really has kept me going ever since. All his advice, all his instructions, have guided me and my husband throughout our lives. Whatever we did, we did with the Rebbe’s blessing, and I think this is why we succeeded. Mrs. Pearl Lebovic and her husband, Rabbi Yeheskel Lebovic, reside in Maplewood, New Jersey, where they lead Congregation Ahavath Zion. They also work as hospital chaplains at the Morristown Medical Center and have spent many years as matchmakers. 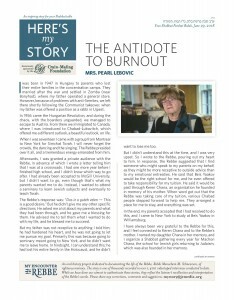 Mrs. Lebovic was interviewed in March of 2018. May they continue to be an inspiration to us!